Our precious tiny girls arrived 3 months early at 28 weeks on August 2, 2010. Reagan weighed 2 lbs 5 oz and Eden was a mere 1 lb ½ oz. Eden fit in the palm of her daddy’s hand. Your financial generosity will help provide support to local NICU’s and lessen the difficulty of the journey that families are going through while in the NICU. Read about how Eden's Gardens is helping families and what's new with this growing non-profit. Despite being healthy and fit, my pregnancy was riddled with problems from the very beginning. I had a twin pregnancy, we were expecting identical twin girls. Because of the complications from my pregnancy I spent 10 weeks on bedrest including four weeks in the hospital. This roller coaster was stressful for a first time expecting couple but it didn’t even come close to the journey that the next eight months would bring. My life and the girls lives were at risk and I had an emergency c-section and on Aug 2nd 2010 our precious tiny girls arrived 3 months early at 28 weeks. Reagan weighed 2 lbs 5 oz and Eden was a mere 1 lb ½ oz. Eden fit in the palm of her daddy’s hand. Our girls endured so much and were tremendously brave during their journey. They taught us more about love and patience than any other life experience or person. Our girls struggled every day because of their prematurity. Our journey was like a rollercoaster dealing with the effects of prematurity- CLD, pulmonary hypertension, surgeries, blood transfusions and feeding difficulties. 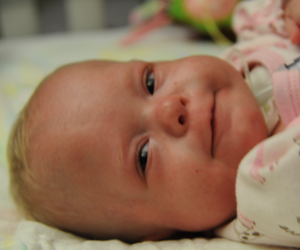 Reagan came home in February 2011 after 197 days in the NICU, but Eden was separated from her sister and spent more time critically ill in the NICU. In March 2011 we determined that Eden was extremely sick and her only chance at life was a double lung transplant. We flew to TCH where they are only one of two hospitals in the nation doing infant lung transplants. Even with Eden’s fighting spirit she was far too sick and passed away in our arms on March 30, 2011. Eden was beautiful; she had sparkling telling eyes and everyone that met her fell in love with her. We struggle every day with the loss of our sweet Eden but are honoring her life in special ways. We created Eden’s Garden as a way to let her spirit live on and for her life to touch others even when she is no longer here.